Every few months, I like to put up an example of the quality work the members of the Distressed Debt Investors Club are sharing with other users of the site. The DDIC now has over 100 members and as many ideas ranging from distressed bankrupt companies to equity shorts. Our forum has over 350 posts where users are sharing commentaries on the market, ideas, job discussions etc. It really has exceeded all my wildest expectations. Without further ado, here is an idea on Tembec. At 86, Tembec term loan allows one to create a Canadian pulp business with sales of $1.7bln at below liquidation value of current assets alone while offering a current yield of ~ 9% and a yield to a 2/28/2012 maturity of 17.2%. Catalyst: partial paydown of term loan from near-term asset sale/s and cash generated from the pulp business as a result of record pulp prices. If 30% of the bank debt is paid down before year-end, the IRR jumps to 23%. During the latest conference call, management claimed they have a number of initiatives in place to raise $71mm over the next 12 months. The $71mm would come from asset sales they deem "non-strategic” which includes the sale of a hydroelectric dam and, IMO, its newsprint facilities. The dam generates 3-4MW, which at $2,000/kw should be valued ~ $7-10mm and should be easy to find a bid given the demand for these assets. Maybe they get $10mm from liquidating the idled Pine Falls mill (185k tons - newsprint) and maybe they could get $130/ton for the Kapuskasing, Ontairo mill (330K tons - newsprint) and bring in another $40mm. The Kapuskasing mill produces grades other than newsprint and is not idled so it should sell for above liquidation value. It seems that management’s liquidity initiative can be realized. In addition to the liquidity initiative, management announced plans to sell two Kraft pulp mills in Europe (both idled) with total capacity of 565,000 tons, which at $70-$140/ton are worth $40mm to $80mm (note that I am being very conservative here - some analyst believe they can fetch ~$200mm). This is all gravy as after paying down the $81mm o/s on its revolver, I believe management will start paying down the term loan. The pulp division is on fire. The devastating earthquake in Chile on February 27th resulted in closure for at least a few months of 4.9mm tons (just under 9% of global chemical paper grade market pulp). Already, there was a large amount of pulp at Chilean ports that was meant to be shipped to Asia which was destroyed or damaged. Bear in mind this is all coming at a time when global pulp supply/demand characteristics are very tight due to wood shortages from wet and cold weather (whose effects continue today) in the southern part of the United States, Northern Europe, Russia, and to a lesser extend Indonesia. Pulp prices are currently US$890/tonne and with the recent price increase will get up to $930/ton. For some context, average pulp prices in 2009 were $709/ton, which caused the pulp division to lose $61mm in EBITDA. However, in 2008 when average pulp prices were $875/ton, the pulp division generated $118mm in EBITDA and in 2007 when average pulp prices were $803/ton, EBITDA was $149mm. Year over year comparison relative to pulp prices is difficult because Tembec’s total shipment tons varied (they shipped just under 2mm tons in 2007 vs. 1.8mm in 2008 and 1.348mm in 2009), but it does give you a broad sense for what they are capable of generating when pulp prices are high. Estimates provided by consultants suggest 2010 pulp prices will average $865/ton. In its annual report, the company estimates that in 2010 every $25 increase in the price of pulp will add ~ $40mm to EBITDA. If we assume average prices in 2010 of $865/ton, then EBITDA for that division should be $180mm. Needless to say, I expect a lot of cash to come out of this business in 2010 and hopefully Jim Lopez will use it to pay down as much of the term loan as possible. Unlikely as it may appear, barring asset sales, a turn in the market might cause Tembec to have to restructure, yet again (see paragraph on restructuring below). The company had liquidity of $129mm as of Dec 26, 2009 ($80mm in cash and $49mm in revolver avail) and bare bones annual cash obligations of $60mm comprising of $31mn interest and $25-30mn of maintenance capex. This is low compared to historical levels ($75mm in 2007 and $86mm in 2006), but I attribute that decrease to the capacity management has taken off-line. The company has seasonal working capital requirements which could exacerbate cash burn dramatically. In FY 2009, Tembec burned through $170mm of cash. The long-term demand story with any pulp player is that China has no fibre, so they have to import from northern Europe, Russia, Canada and Indonesia. Tembec is well positioned to benefit from this trend. There are no material new pulp mills coming online before 2013, so pulp prices should, all things being equal, remain strong for a while. That noted, higher pulp prices, now having surpassed last year’s 13-year peak will tend to increase pulp supply at a time when paper demand is in secular decline. Consultants seem to believe that pulp supply will be pushed higher through Q2 and Q3 while demand should contract so that pulp prices are likely to move lower in the 2H of 2010. So far there is 3.235mm tons of capacity slated to restart/come online in late 2009 – mid 2010, or 5.57% of global capacity. Looking at this from a liquidation lens, current assets alone should cover the secured debt. As of December 2009, the company had $80mm in cash, $259mm in AR, $318mm in Inventory. I assume NO value for cash since this company has been burning cash ($170mm in negative FCF in 2009). I discounted AR by 15% and discounted Inventory as follows: (finished goods by 15% and WIP and raw materials by 50%). I then took another $20mm hair-cut to account for further cash burn and fees. That leaves $402mm to cover $430mm of secured debt including the $307mm term loan. This suggests the secured debt is covered by 93% on a liquidation of current assets alone. Note that the book value of Tembec’s PP&E is $617mm - which I ascribe no value to for purpose of this analysis. Even if we assume a further max draw of $49mm from factoring facilities and the CIT revolver for total secured debt of $479mm, the secured debt would still be covered by 84%, or right around current trading levels. On thing to bear in mind when considering a hypothetical liquidation for Tembec is the pension liability of $197mm and $24mm of “other long term liabilities” such as govt assistance, environmental, reforestation, etc. In the interest of erring on the conservative side, let’s assume the $24mm of govt assistance,reforestation & environmental liability is treated as a priority claim (in Abitibi, the Provence of Newfoundland is making the case that environmental liabilities should be treated as an administrative claim) and let’s assume $150mm of the pension liab (ex OPEB) is pari-passu with the secured debt (it is Canada, after all), then secured debt coverage from the liquidation of the current assets comes to 60%-65%. Needless to say, I view this as the worst case scenario – one that is mitigated by the current yield on the bank debt of 9% and any value coming from the liquidation of the plants which, even at $30-$50mm for the three pulp plantsm, should add another 5pts to 9pts of recovery (Tembec’s pulp mills have a book value of $454mm). Tembec also has $15mm of guaranteed notes (booked as “investments”) in West Feliciana Acquisition – a company that purchased a paper mill from Tembec in April 2009 (a portion of the consideration included these notes). WFA filed for bankruptcy in January 2010 and the ranking of the notes Tembec owns is still unclear so I am treating this as pure optionality, but still worth noting as it could add another 3pts to recovery. 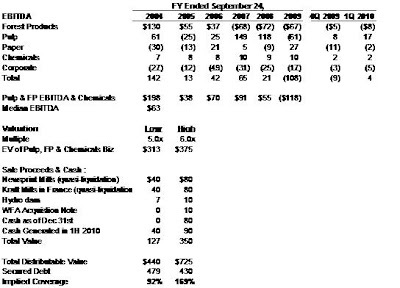 Tembec’s EBITDA in fiscal 2009 (FYE Sept) was negative $108mm. Lately, things seemed to have turned a corner primarily as a result of the pulp markets. In the 1st quarter of FY 2010 (ending December 2009), the company generated $4mm of EBITDA. The Pulp division generated $17mm of EBITDA in the 1stquarter which was offset by negative EBITDA in other segments (forest products & paper). I think Tembec will shed its paper division (newsprint) and continue as a going concern with pulp, forrest products (the two are integrated) and the chemicals business. Based on my math, it is not unreasonable to assume that a going concern value for these three divisions is worth over $300mm. Add to that proceeds from hypothetical asset sales (there may be some double counting from the kraft mills in France - which historically may have contributed to the pulp division’s EBITDA) and it seems the term loan is money good. -$205mm CIT credit facility maturing December 2011, of which $127mm was available under the current borrowing base and $81mm was drawn and $36mm was reserved for LC’s. $9mm was unused. -$67mm of factoring facilities supporting the French operations. $27mm was drawn. $40mm was unused. In February 2008, Tembec went through an out-of-court restructuring which resulted in the $1.2bln of bonds receiving 95% of the equity with the remaining 5% going to existing shareholders. The bondholders backstoped the current $306mm term loan. The term loan pays L+700 and has a 1st Lien on assets other than receivables and inventory and a 2nd lien on AR and inventory. The loan has a prepayment premium of 3% in 2010 and 2% in 2011. There are certain covenants with respect to debt incurrence, permitted liens, limitation on guarantees and transactions. There seems is one financial maintenance covenant that matches the covenant in the company’s existing working capital facility. Needless to say, this is somewhat “covi-lite”. The market value at the time of the restructuring was ~ $570mm. Today’s market value is ~ $500mm. As with any Canadian paper and pulp business, one has to keep in mind that there are severe cash flow swings resulting from exchange rate fluctuations. In Tembec’s case, a 1% increase in CAD$ vs. the USD equates to a $20-$25mm hit to EBITDA. Along those same lines, the competitiveness of Canadian producers relative to other major competing regions remains under pressure due to the high level of the Canadian dollar. With an exchange rate of around US$0.95/C$, Canada is one of the high-cost regions for the production of pulp, newsprint, and lumber. The Canadian dollar has also rapidly strengthened against the euro over the past three months, which has reduced the competitiveness of Canadian pulp producers relative to their European counterparts. Further, Tembec’s mills are smaller than their competitors and older and they have been under-spending on capex. Finally, Forest products division is obviously levered to housing starts. However, when demand comes back, that the Forest products division is poised to do well since there is a lot of operating leverage in that division as a result of low inventories and cost cuts that were implemented over the last few years. "allows one to create a Canadian pulp business". I've never understood this terminology. What do distressed investors mean when they say they can "create a business" at such and such multiple? I believe "create a company" basically means "own a company." So if you you have 100mm of debt that would be the fulcrum security in a reorganization, and the debt is trading at 85, you can "create the company" for 85 million. Man it reads like a novel, hope I'll write like him/her one day.